The Minister of State (Independent Charge) for Environment and Forests, Smt. Jayanthi Natarajan and Delhi Chief Minister Smt. 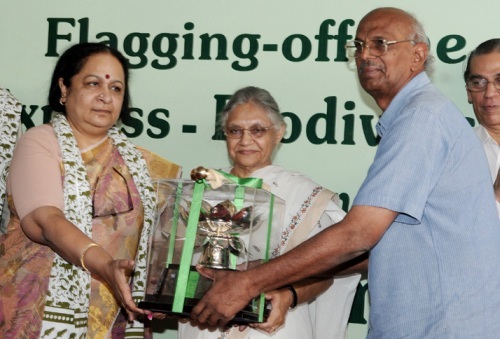 Sheila Dikshit presenting the Indira Gandhi Paryavaran Puraskar to Emeritus Professor C.R. Babu from the University of Delhi at the flagging off ceremony of the “Science Express- Biodiversity Special” Train on the occasion of World Environment Day in New Delhi. Congratulations to Professor Babu on a very well deserved award. Prof CR Babu deserves special congratulation for the change of mind-set of the Mining Engineers to preserve the biodiversity and ecologically restored the mine degraded lands. earned them each a enormous quantity of devoted fans. Prof.C.R.Babu ..a role model for the students and researchers ..Congratulations sir for the award.. Worked under prof. C.R. Babu from 1998 to 2003. He is really devoted towards his works and worked for late hrs in his laboratory. He is the real hero of the society for providing us a green and clean environment. Sir congrats for this well deserved award. Amita sinha here,my best wishes to u sir.